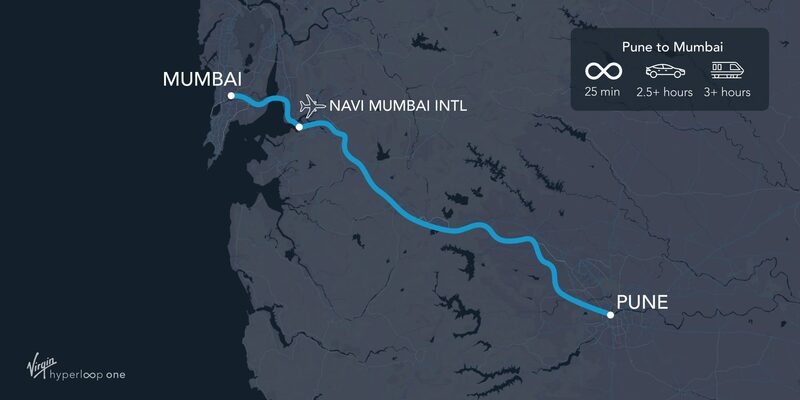 India’s first hyperloop route is set to be built between Pune and Mumbai, via Navi Mumbai International Airport, following the signing of a framework agreement between the state of Maharashtra and Virgin Hyperloop One (VHO). The announcement follows the completion of a preliminary study into a hyperloop system between the two largest cities in Maharashtra. A further in-depth feasibility study will now follow, further detailing route alignment, environmental, economic and commercial considerations and the necessary regulatory framework. After procurement, construction of the public-private hyperloop project will follow in two phases, beginning with a demonstration track built between two points on the route. The demonstration track will be constructed in two to three years from the signing of the agreement, according to VHO, and serve as a platform for testing, certifying, and regulating the system for commercial operations. The second phase will aim to complete construction of the full Pune-Mumbai route in five to seven years. An electric hyperloop system for passengers and cargo could connect the two cities in 25 minutes. The same journey by train would take more than three hours. According to the preliminary feasibility study, a Pune-Mumbai hyperloop could result in $55 billion in socio-economic benefits over 30 years of operation through time savings, emissions and accident reduction and operational cost savings. At a signing ceremony wth prime minister Narendra Modi and Maharashtra chief minister Devendra Fadnavis, VHO chairman Richard Branson said he believes that the hyperloop could have the same impact on India in the 21st century as trains did in the 20th century.